Amazon AppStream 2.0 gives you access to Windows desktop applications through a web browser. Thousands of AWS customers, including SOLIDWORKS, Siemens, and MathWorks are already using AppStream 2.0 to deliver applications to their customers. Today I would like to bring you up to date on some recent additions to AppStream 2.0, wrapping up with a closer look at a brand new feature that will automatically save application customizations (preferences, bookmarks, toolbar settings, connection profiles, and the like) and Windows settings between your sessions. User Enhancements – Support for time zone, locale, and language input, better copy/paste, and the new application persistence feature. Admin Improvements – The ability to configure default application settings, control access to some system resources, copy images across AWS regions, establish custom branding, and share images between AWS accounts. Storage Integration – Support for Microsoft OneDrive for Business and Google Drive for G Suite. Regional Expansion – AppStream 2.0 recently became available in three additional AWS regions in Europe and Asia. Let’s take a look at each item and then at application settings persistence…. In June we gave AppStream 2.0 users control over the time zone, locale, and input methods. Once set, the values apply to future sessions in the same AWS region. This feature (formally known as Regional Settings) must be enabled by the AppStream 2.0 administrator as detailed in Enable Regional Settings for Your AppStream 2.0 Users. In July we added keyboard shortcuts for copy/paste between your local device and your AppStream 2.0 sessions when using Google Chrome. In March we gave AppStream 2.0 administrators additional control over the user experience, including the ability to customize the logo, color, text, and help links in the application catalog page. Read Add Your Custom Branding to AppStream 2.0 to learn more. In May we added administrative control over the data that moves to and from the AppStream 2.0 streaming sessions. AppStream 2.0 administrators can control access to file upload, file download, printing, and copy/paste to and from local applications. Read Create AppStream 2.0 Fleets and Stacks to learn more. In June we gave AppStream 2.0 administrators the power to configure default application settings (connection profiles, browser settings, and plugins) on behalf of their users. Read Enabling Default OS and Application Settings for Your Users to learn more. 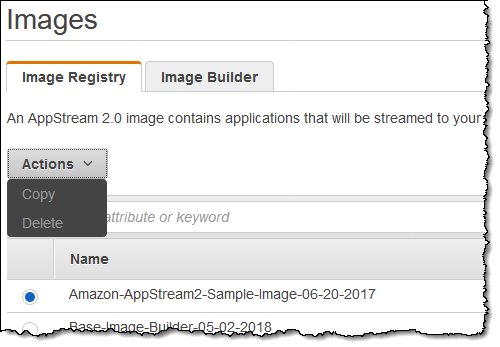 In July we gave AppStream 2.0 administrators the ability to share AppStream 2.0 images between AWS accounts for use in the same AWS Region. To learn more, take a look at the UpdateImagePermissions API and the update-image-permissions command. Launched in June, the Google Drive for G Suite support allows users to access files on a Google Drive from inside of their applications. Read Google Drive for G Suite is now enabled on Amazon AppStream 2.0 to learn how to enable this feature for an AppStream application stack. Similiarly, the Microsoft OneDrive for Business Support that was launched in July allows users to access files stored in OneDrive for Business accounts. 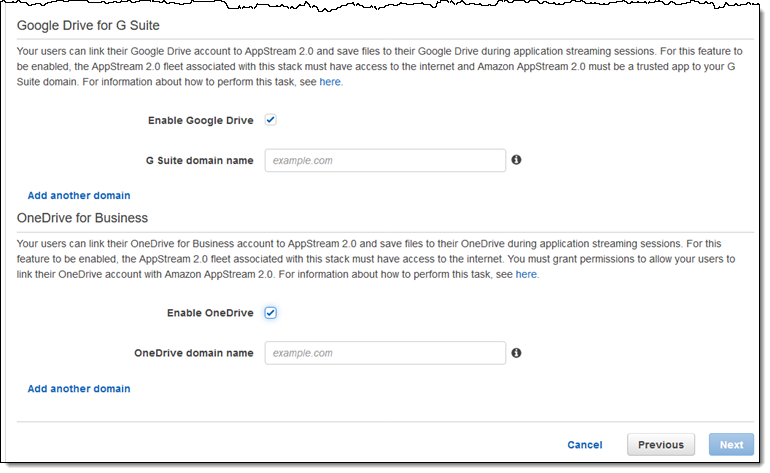 Read Amazon AppStream 2.0 adds support for OneDrive for Business to learn how to set this up. In January we made AppStream 2.0 available in the Asia Pacific (Singapore) and Asia Pacific (Sydney) Regions. In March we made AppStream 2.0 available in the Europe (Frankfurt) Region. See the AWS Region Table for the full list of regions where AppStream 2.0 is available. With the past out of the way, let’s take a look at today’s new feature, Application Settings Persistence! Windows Profile – The contents of C:\users\user_name\appdata . Windows Profile Folder – The contents of C:\users\user_name . Windows Registry – The tree of registry entries rooted at HKEY_CURRENT_USER . This feature must be enabled by the AppStream 2.0 administrator. The contents of the Windows Roaming Profile are stored in an S3 bucket in the administrator’s AWS account, with an initial storage allowance (easily increased) of up to 1 GB per user. The S3 bucket is configured for Server Side Encryption with keys managed by S3. Data moves between AppStream 2.0 and S3 across a connection that is protected by SSL. The administrator can choose to enable S3 versioning to allow recovery from a corrupted profile. Putting multiple stacks in the same settings group allows them to share a common set of user settings. The settings are applied when the user logs in, and then persisted back to S3 when they log out. This feature is available now and AppStream 2.0 administrators can enable it today. The only cost is for the S3 storage consumed by the stored profiles, charged at the usual S3 prices. PS – Follow the AWS Desktop and Application Streaming Blog to make sure that you know about new features as quickly as possible.